Picnic party essentials will help you celebrate your independence this 4th of July with a BANG and a BOOM! Decorative party favors with paper plates, cups and napkins. For the children or young at heart party hats will be a nice addition. Celebrate with fireworks and red, white and blue. Bring in the party with special invitations for Independence Day. Include the BBQ food and enjoy good company. Having a themed party that includes the American flag, colorful fireworks and the holiday theme is the way to go, because you want your party to explode with excitement with true patriotism. Still time to order the party favors and send out those invitations. Here are some party invitations and picnic supplies to make this day extra special. All these party paper products are customizable. Exchange the images and text for your own personal ones if you like to. 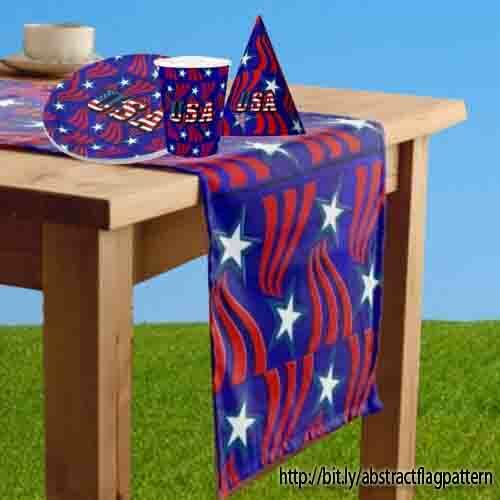 Though you can never go wrong with the American flag designed party accessories. Another version of the vintage patriotic children with fireworks in the background is available to view here along with other Patriotic products. These same vintage children are shown on the paper cup below with the colorful modern star design. Often on Sandyspider Gifts you will see a combination of modern and vintage images on one product. Fun holiday outdoor dining essentials along with custom plates for the family named gathering. Note: The intro image was made in on Polyvore of the Abstract Flag Pattern Gifts on Zazzle. This is where the table runner can be found. Wedding invitations need to express the bride and groom and their personalities. The big day could be a spring or summer wedding. A theme to reflect the season is a good idea. One can never go wrong with a flow of flowers and butterflies on invitations. Maybe it is a fall wedding with autumn leaves or the fall colors. The colors of browns, yellows, orange and red would be beautiful on the invites. Save the date would be as simple as a postcard with a photo of the happy couple, or step it up a notch with a photo card. Cards involve the bridal shower, bachelorette and bachelor parties. The rehearsal dinner, wedding invitations need to be sent out. For the couple with the sense of humor, an entire mustache theme is still popular. If they have been together for a while, the bride dragging the groom to the altar is quite funny. 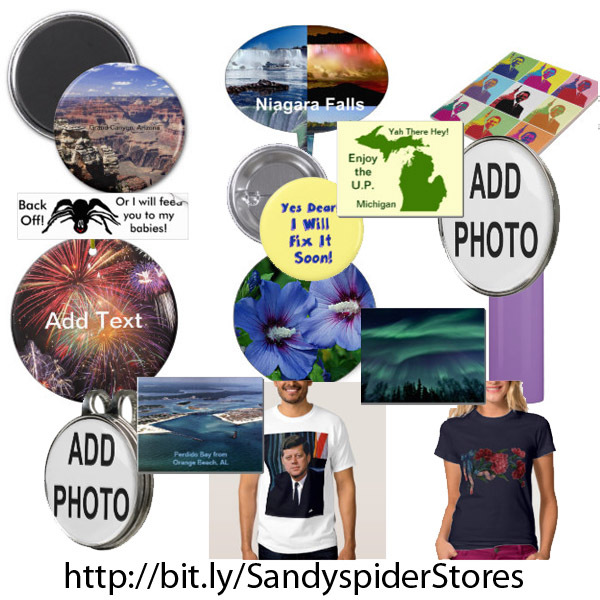 These items are usually on sale at Zazzle from 15% to 50% and sometimes even better. Check the top of their site page for the special code at checkout. Contact me at admin@giftsyoutreasure for specials and custom made products. 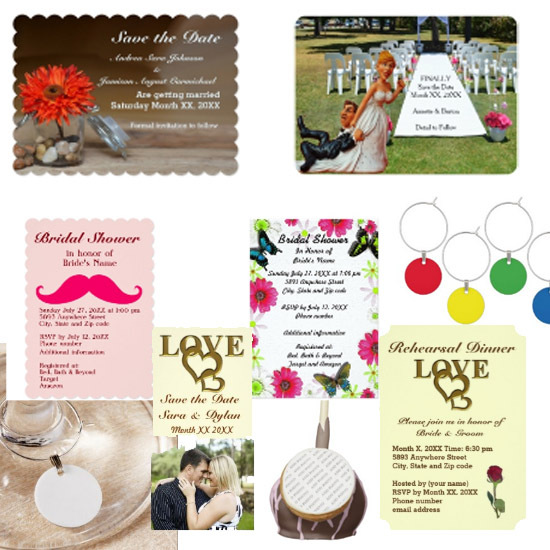 At Sandyspider Gifts on Zazzle there are more "Save the Date" and "bridal Shower" cards then the entire wedding program. For your special day, if you find a design you love from these, I can create a full set of cards, programs and more to make that day perfect. Serious or funny! A fall wedding would mean a summer bridal shower and the colors of autumn during the wedding day. Mixing these styled themes would make sense. Though there is a bridal shower card to match. Gold love and hearts are beautiful for any season and fit with any theme. Create some wine charms and cake pops. Ask me to custom these to your theme.